A great central location makes the Premier Inn Stirling City Centre perfect for exploring this historic city. Close by you will find Stirling Castle and the Battle of Bannockburn visitor centre. This Hotel has a Beefeater restaurant and offers free on-site parking. The hotel features the new upgraded Premier Inn bedrooms, each featuring an impressive 40" flat screen TV, freshly-updated bathroom with large shower head, and brand new, slumber-inducing, king-size Hypnos bed. Book direct for the best Premier Inn Stirling deals. Located 3 miles from Stirling Castle and Stirling Train Station and just a quarter of a mile from junction 9 of the M9/M80, providing the perfect base from which to explore the area. 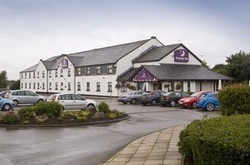 This Premier Inn provides a Brewers Fayre restaurant serving good value meals throughout the day and offers free on-site parking. Book direct for the best Premier Inn Stirling deals.